EVANSVILLE, Ind., January 17, 2013 — A number of local, as well as national, charities benefited this week as Evansville used equipment reseller Sigma Packaging wrapped up their 2012 Season of Giving drive on Wednesday. 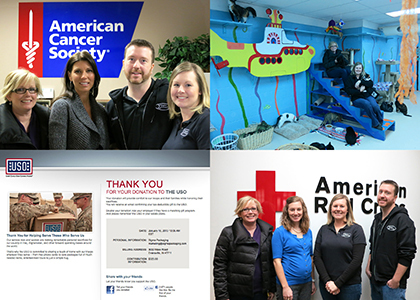 The monetary donation, a portion of December's packaging equipment sales, totaled $2,550.00 and was distributed to four pre-selected charities: The American Red Cross, American Cancer Society, the Humane Society, and the USO. "We are honored to be able to help so many great causes this year," said Rob Palmer, Sigma Packaging owner and president. "As our business grows, we hope to be able to increase our charitable contributions and encourage others to do the same." As a fairly new company in the packaging and processing equipment industry, this is the first time Sigma has requested support and input from their customers on contributions. A key element of the Season of Giving drive was allowing customers to choose the contribution's beneficiary and, thus, support a cause meaningful to them. The individual charities, as selected by customers, received the following donations: $775 to the American Cancer Society; $725 to the American Red Cross; $725 to the Humane Society of the United States; and $325 to the USO. "The holiday season is the perfect time to help others who, for any reason, have not been as fortunate," said Palmer. "We were eager to give back and wanted to include our customers in the process. We wouldn't be in the position to donate if it wasn't for them." The company aims to increase their community involvement and outreach for the new year. "Rather than giving back once a year, we are seeking ways to contribute more as a team, financially or physically, throughout 2013," said Palmer.